twice-daily motion. No wonder that there have been attempts at harnessing this energy: in the past by channelling some of the water to drive mills, more recently to turn turbines and generate electricity. Such a power station was built in Brittany, France in the 1960s, at the mouth of the Rance estuary. so far, tidal power schemes have relied on a barrage being built across an estuary, designed to impound the incoming tide. When a head of water has built up behind the barrage, the ebbing tide rushes over and turns the turbines located in the dam - as the river does in hydro-electric power schemes. Clearly, putting a barrage across changes the nature of an estuary in many ways as happened at La Rance where erosion and siltation, loss of estuarine habitats and species, pollution and difficulties for shipping - despite locks - were and still are serious problems. In Britain, the quest for renewable energy sources has, in the late 1980, included proposals for tidal energy generation in several estuaries including the Mersey and the much larger Severn. 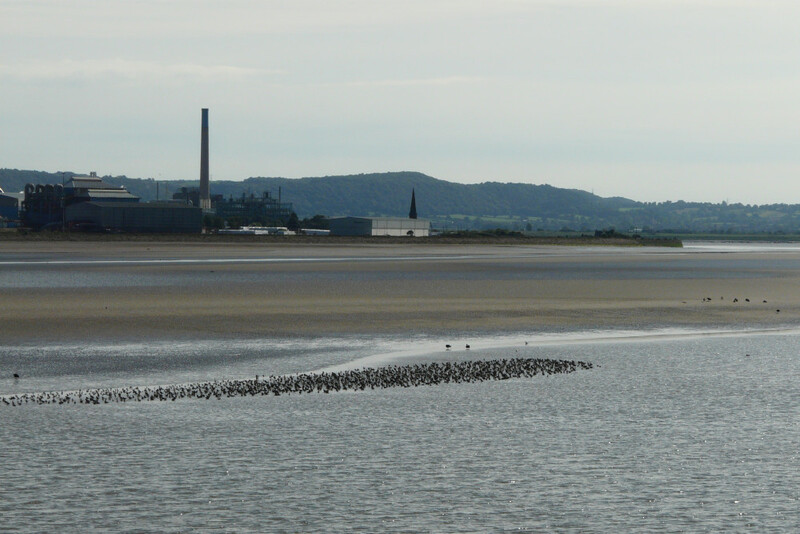 For the Mersey, detailed studies were carried out, foremost to establish the feasibility of a barrage taking into account the likely effects on the estuarine hydrology, on erosion and sedimentation patterns, dangers of flooding and increased pollution, on mud, sand and saltmarsh habitats, on the large, nationally and internationally important water fowl populations which these habitats support and - in view of all these factors - on the best location for a barrage. Mainly for financial reasons the proposals were shelved for the Mersey. Following a revival after the turn of the millennium, the financial case for a Mersey barrage was again not upheld while studies continued for the Severn - with uncertain outcomes. It was because of the many potential threats to estuaries that Estuary Conservation Groups were formed in the late 1980s, among others the Dee Estuary Conservation Group and the MECG. They represent numerous environmental organisations from both the voluntary and statutory sector as well as individual members. Their aims are to scrutinise any proposals that could adversely affect estuaries, to publicise the importance of protecting the estuarine ecosystem and to put forward solutions to problems. The MECG warned about the damage that a full barrage across the Mersey would cause - to its ecology, wildlife, shores and adjacent communities. The impact on shipping and the high building costs in terms of money and energy were also strong arguments against the barrage option. At the same time, the MECG recognises that, in view of the global threats which the continued exploitation and burning of fossil fuels poses, generating electricity from tidal power must be regarded as an acceptable alternative, providing more benign schemes are put in place than barrages across estuaries. Some of the possibilities that are being considered for estuaries are Tidal fences, Tidal gates, Water wheels and Spectral mass energy converters. In the open sea, Tidal lagoons are an option worth pursuing while approval was given in September 2013 for the installation of Tidal turbines into the strong currents of the Pentland Firth, between mainland Scotland and Orkney. Waders feeding on the intertidal mudflats. some energy from the flow of water, the effect will be minimal with smaller schemes. In estuaries, most significantly, the tidal range will not be reduced. Large expanses of intertidal mud and sand will remain exposed at low tide and saltmarshes be covered by high tides - habitats which are vital feeding and roosting habitats for the wading birds and duck that winter in huge numbers in British estuaries. Several websites give information about tidal power schemes that do not rely on barrages across estuaries. The RSPB response is: The government haven’t slammed the coffin lid shut completely yet. They say they are still keen to hear from well thought through proposals for harnessing tidal power. 1. Government has dismissed Hafren Power’s proposal as ‘hypothetical’, stating that they have failed to demonstrate either effective mitigation of environmental impacts or value for money. 2. Government reiterates support for the approach advocated by Regen SW and supported by NGOs and industry alike. 3. As yet another barrage proposal bites the dust, let us hope that Government will now join with NGOs and industry in focussing on ways to extract valuable clean, green energy from the Seven Estuary in ways which will not destroy this internationally important site for wildlife.